Australia is slipping in the global business rankings. We’re down from 17 to 21 for business competitiveness, and down from 17 to 27 for business efficiency. In a country that is working hard to be innovative, focused on science and space, with a leading role in guiding our planet into the future, this is a serious matter. We’re just not very good at diversity. Diversity is the key to better bottom lines, teams with faster problem-solving abilities, and greater innovation capacity. Diversity is what we need to focus on if we want our government, corporate, and third sectors to be the best that they can be. Australia is excellent at counting diverse cohorts of people, but not very good at using those people for their expertise and their whole range of talents. Australia is also particularly poor at diversity in leadership. It is still a remarkable thing to see a person with disability, for example, in parliament or a board room. Worse still, we have no track record in using our diverse talent intersectionally, in understanding that many people are part of multiple diversity groups. Intersectionality recognises population groups, but it also recognises that many people in minority or disadvantaged groups come from one or more of those groups. A person might be an Indigenous woman with disability, or a young trans culturally diverse man. Intersectionality is when different population groups intersect within the same person – the United Nations has also called it “multiple disadvantage”. Approaching diversity through the prism of intersectionality assists us with bringing different population groups into a recruitment process without siloing into one area. It recognises that all diversity groups are present right across our population. Intersectionality is one thing, but it needs to go hand in hand with recognising that people with disabilities are leaders and have considerable qualities to contribute to shaping Australia’s future. Disability leaders are potentially the missing element that is needed to improve those global business rankings. While various diversity groups have had increasing levels of attention to their development, including leadership training and support, people with disabilities have been left by the wayside. Australia has never had a consistent ongoing program to develop disability leaders or to support those who are doing leadership work. Unlike other diversity groups who have had specialist leadership programs for some time, people with disabilities are expected to cut it in the mainstream. No prizes for guessing why there aren’t many leaders with disabilities kicking around. In fact, a 2016 survey showed that most of the disability leaders who access mainstream leadership training are then marginalised and never get to use their skills and qualifications. Christina Ryan has been an active leader in the Australian disability community for over 20 years. The Disability Leadership Institute (DLI) is now providing Australia’s first ongoing program of disability leadership development and support. Instead of continually working to address the outcomes of inequality, such as endemic violence, the DLI is working on addressing that inequality directly by making sure disability leaders are skilled up and in the room. People with disabilities have almost no presence in politics, in high levels of business or government, or as members of boards or advisory groups. Often it is assumed that there are simply no people with disabilities qualified to operate at these levels, or that people with disabilities can only be experts in disability-related areas. So, leaders with disabilities are rarely in the room and remain invisible. Few disability leaders are known; even fewer are appointed or recognised. Being in the room is a skill, but leadership isn’t just about skills, it’s also about attributes or personal qualities. So, the DLI has been examining what “disability leadership” is. Is it a different style of leadership from others? In what way? Are there things that disabled people have to offer that others don’t? These are big questions and we don’t yet have definitive answers, but we can start by recognising that Australia already has people leading our disability rights movement, those who pull everyone together, lead the conversation, mentor the emerging talent. Then there are the (very few) disability leaders who are out in the mainstream. This is still a very unresearched area and it needs a lot more work, so the DLI’s current research has focused on the first group. Resilient. The gold star leadership quality that the books all say leaders need to develop, yet disability leaders already have it in spades. There is nothing like being marginalised and discriminated against daily, and still managing to change the world, to build resilience. Many disability leaders do this while in great pain and without the right supports or equipment. Leadership training over the years has put people through extreme situations as a way of getting in touch with themselves and how they relate to others. A bonus of disability is that you get the extreme experience without having to pay a course fee or undertaking wilderness training! Lateral thinking. Disability leaders operate with little or no resources, lack of supports, wrong supports, no money, and while being marginalised. So, they’ve developed an ability to think laterally, to find solutions outside the box, to work out a way, some way, any way, to approach a problem or barrier. In some ways this is about attitude: “I’ve decided this will happen; we just have to work out how”. Disability leaders are experts in lateral thinking and use it constantly. Persistent. Refusing to accept barriers. There is no way a person can operate as a disability leader unless they can manage to plough on and refuse to let anything get in their way. The barriers are enormous and varied; everything that has been achieved by the disability community has been against the odds, through sheer persistence, with a strong sense of “get it done”, often at the expense of the people concerned. People have literally put their lives on the line for progress. Disability leaders are often asked to speak at conferences that have no ramps to the stage, or where the toilets are three floors down and need a key, or to fund their own access needs, or to work in environments that are inherently hostile, or alongside people who bully and harass them. Persistence contributes the ability to come at things another way. No problem is insurmountable; a person just works out how to get around it. Once the decision has been made that something must happen, then it’s simply a matter of how it will happen. The rest is detail. Inclusive. It’s very topical and creating a lot of work for diversity consultants, yet disability leaders are already specialists in this critical quality: the ability to make sure that everyone who needs to be present is, and to then make sure that everyone present can participate equally. Disability leaders do this without thinking; it is part of their fabric and their modus operandi. It comes from working with such a large and diverse community every day. Collaborative. Rather than going it alone, disability leaders are highly collaborative leaders who pull coalitions together and work with groups. For many this is necessary simply because they are not in a position to work alone, while for others it is an extension of inclusion and their problem-solving inclinations. When disability leaders have an idea, they are more likely to reach out to colleagues to collaborate than to operate in isolation. When considering these attributes and the way disability leaders approach problems, it becomes clear that this is a different style of leadership from what is going around already. It is leadership that can contribute substantially to resolving big-picture real-world challenges. With Australia’s slippage in the global business rankings, we need to start thinking more outside the box. We need all the innovation and lateral thinking we can find. For many people, it is still confronting to hear the words “disability” and “leadership” in the same sentence. They haven’t necessarily ruled out the idea of disability leadership, but it simply hasn’t occurred to them that it exists and that it should be embraced, developed and used. There remains a total absence of action to build and support disability leaders within leading government, corporate and third sector agencies, even in organisations that have a strong number of disabled employees in their workforce. Disability leaders are inventive, persistent, but most of all resilient in ensuring that they play a role in shaping the agenda. Australia needs its disability leaders. It needs their experience and valuable attributes to shift the big picture so that Australia remains globally competitive, can meet the challenges of the future, and can develop solutions that are creative and collaborative. 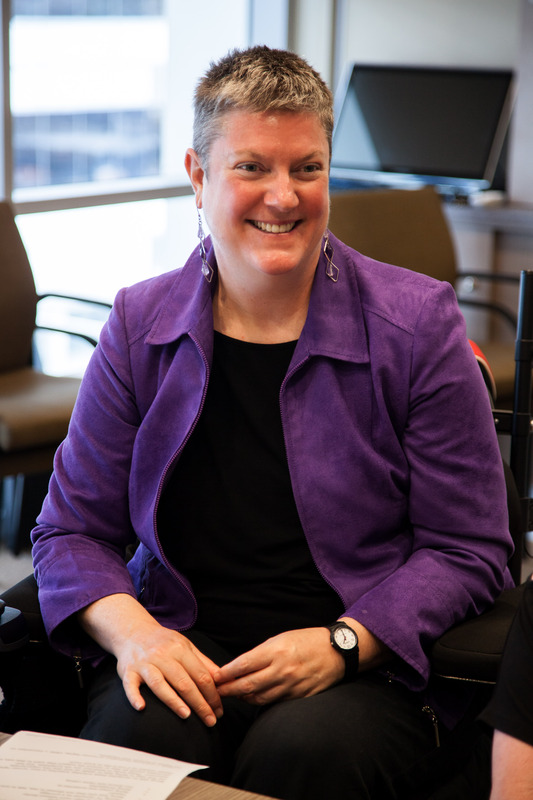 Christina Ryan has been an active leader in the Australian disability community for over 20 years, working at an international, national and local level to change the diversity agenda. She pioneered the use of mainstream forums by women with disabilities at the United Nations, and now mentors and teaches effective use of the UN for rights activists globally. She established the Disability Leadership Institute in 2016 as a professional hub run by and for disability leaders.